Edgar Degas (19 July 1834 – 27 September 1917), born Hilaire-Germain-Edgar Degas, was a French artist famous for his work in painting, sculpture, printmaking and drawing. He is regarded as one of the founders of Impressionism although he rejected the term, and preferred to be called a realist. A superb draughtsman, he is especially identified with the subject of the dance, and over half his works depict dancers. These display his mastery in the depiction of movement, as do his racecourse subjects and female nudes. His portraits are considered to be among the finest in the history of art. Early in his career, his ambition was to be a history painter, and for this his academic training and close study of classic art had superbly prepared him. Upon abandoning this project, he brought the traditional methods of a history painter to bear on contemporary subject matter, and became a classical painter of modern life. 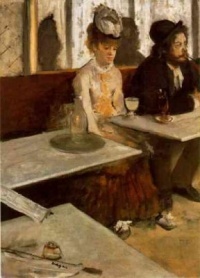 During his life, public reception of Degas' work ranged from admiration to contempt. As a promising artist in the conventional mode, Degas had a number of paintings accepted in the Salon between 1865–1870. These works received praise from Pierre Puvis de Chavannes and the critic, Castagnary. Degas soon joined forces with the Impressionists, however, and rejected the rigid rules, judgements, and elitism of the Salon—just as the Salon and general public initially rejected the experimentalism of the Impressionists. Degas's work was controversial, but was generally admired for its draftsmanship. His La Petite Danseuse de Quatorze Ans, or Little Dancer of Fourteen Years, which he displayed at the sixth Impressionist exhibition in 1881, was probably his most controversial piece. The suite of nudes Degas exhibited in the eighth Impressionist Exhibition in 1886 produced lots of reaction. Recognized as an important artist by the end of his life, Degas is now considered one of the founders of Impressionism. Though his work crossed many stylistic boundaries, his involvement with the other major figures of Impressionism and their exhibitions, his dynamic paintings and sketches of everyday life and activities, and his bold color experiments, served to finally tie him to the Impressionist movement as one of its greatest early artists. His paintings, pastels, drawings, and sculpture—most of the latter were not intended for exhibition, and were discovered only after his death—are on prominent display in many museums. After his death in 1917, more than 150 sculptural works were found in his studio, of which the subjects mainly consisted of race horses and dancers. Degas scholars have agreed that the sculptures were not created as aids to painting. His first and only showing of sculpture during his life took place in 1881 when he exhibited The Little Fourteen Year Old Dancer, only shown again in 1920; the rest of the sculptural works remained private until an exhibition after his death in 1918. Sculpture was not so much in response to his failing eyesight as one more strand to his continuing endeavour to explore different media. Wherever the possibility seemed available, he explored ways of linking graphic art and oil painting, drawing and pastel, sculpture and photography. Degas assigned the same significance to sculpture as to drawing: "Drawing is a way of thinking, modelling another." Degas in his pastel in the National Gallery of a La Toilette (Woman Combing Her Hair). Unless indicated otherwise, the text in this article is either based on Wikipedia article "Edgar Degas" or another language Wikipedia page thereof used under the terms of the GNU Free Documentation License; or on original research by Jahsonic and friends. See Art and Popular Culture's copyright notice. This page was last modified 19:16, 26 October 2015.